Ford and Mercury cars of the late 40s and early 50s share many steering, braking, and handling characteristics. These cars feature large, bulging frame rail spring pockets and king pin suspension which make them extremely strong, but virtually impossible to modernize. Lopping off a few coils from the front springs and adding lowering blocks to the rear is simply a Band-Aid to improving the ride of an antiquated suspension, weak drum brakes, and slow-response steering. What to do? The economical, safe, and easy fix can be found by simply installing an aftermarket, weld-on custom crossmember. Our friends at Total Cost Involved Engineering of Ontario, CA have an extensive line of chassis and suspension components that fit the bill. The TCI crossmember that best matches the frame rail width of the 1951 Mercury is designed as a suspension update for the 1956 Ford F-100. It is amazingly close to corresponding to the Merc’s front rail measurements! That’s the beauty of the classic car scene–as enthusiasts part of the excitement is discovering new fitments and compatible parts that different makes and models often share. A ’51 Merc is an undisputed leader in lead sled design, especially when sporting a chopped top and enhanced body lines. All it needed was a Total Cost Involved modern suspension featuring power brakes, power steering, big whitewalls, and air bags which delivered a serious suspension drop. This aftermarket kit comes complete with an American made 10-gauge steel crossmember, thick-steel spring hats which now feature vertical GM style brackets for caster and camber adjustments, 11-inch disc brakes, GM style calipers, American-made stock or two-inch drop spindles, a one-inch anti-sway bar, tubular A-arms with heavy-duty lower ball joints along with front mounted rack & pinion steering. Options include a power steering rack upgrade for $100 and double-convoluted Firestone air bags for about $400. With free shipping, the whole crossmember kit including the above options retails for approximately $2,600. Installation of the aftermarket TCI crossmember was performed by the talented crew from Norton Customs out of Huntington Beach, CA. Installation will require the fabrication of new frame rails from the firewall forward which are not included in the TCI kit. 10-gauge mild steel, two by four-inch rectangular tubing works well for the construction of custom frame rails, which must be cut and fit as a direct replacement of the original rails in height, length, and width. The rails should be tapered in the front to accept the bumper brackets along with a fabricated bracket to serve as a radiator core support. A look at the images illustrates these custom made pieces as being rather straightforward. The 1951 Mercury depicted in this installation features a 118-inch wheel base. Few fabricators have a steel work table large enough to retain this chassis and instead rely upon level, smooth concrete to ensure the stock chassis remains flat and square during modification. Be advised you should mark the concrete floor using a plumb bob to establish the replacement front axle location before making any cuts to the chassis. Also, weld temporary braces to ensure the stock frame rails do not spread or twist while the stock chassis snout is removed! TCI supplies complete installation instructions for the mounting of the crossmember as well as step-by-step directions which can be reviewed on TCI Engineering’s homepage for the addition of steering and suspension components. This will aid in your plans to modify your car’s suspension. 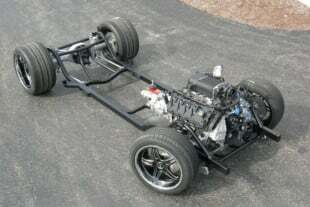 A complementing 4-link suspension utilizing TCI axle plate mounts for sleeved air bags and universal top brackets welded to the frame rails were utilized to drop the rear suspension’s ride height. An air tank, two compressors, and front-and-back switches and gauges will be added to control the Merc’s adjustable ride height. The rear is a Currie Enterprises, new 9-inch Ford rearend featuring a nodular case, 31-spline axles and a TSD posi-rear gear. We opted to use a TCI 12.19-inch rear disc brake system which comes with an internal parking brake to complement the front disc brake system. With skirts in place, nothing will be showing except for some whitewall. With the TCI suspension in place and air bags added, this chop top, 1951 Merc now has the desired, slammed-to-the-ground, eye-catching stance that lead-sledders desire. These heavy behemoth cars need and require a strong, safe suspension and brakes, which can all be accomplished on a budget using this replacement crossmember method! Check out the rest of the article below and follow along to view a typical shop installation. The Merc’s stock antiquated front king pin suspension was cut off at the firewall, leaving the side plates long enough to enhance joint strength by overlapping the new frame rails fabricated from 45-inch lengths of 2 x 4-inch steel rectangular tubing. A chassis table was used to ensure the new rails were level, square, and true during the bonding process. TCI’s Custom Coil Spring front suspension crossmember designed for the 1953-56 Ford F-100 is within 1/8th of an inch of the Merc’s frame rail width and a perfect match to a four-inch frame rail height. A recent engineering change to this kit was the addition of vertical bars enabling the use of fork-style shims creating precise caster and camber adjustment. It is critical that the stock wheel base is retained to ensure the wheels are centered in the fender openings. Left: Scott of Norton’s Customs of Huntington Beach, CA clamps all the new suspension components into place and double checks the car’s wheel base by referencing lines scribed onto the new frame rails. Clean lines of the junction area of the new frame rails to the stock chassis appear to be factory original. Right: Take note of the angle built into the driver’s side of the spring top hat. Once installed this spring hat will deliver caster which will self-center the steering wheel and allow the driver to trust the car to travel in a straight line with little effort required to change direction. Note the small gap between the crossmember and the new frame rails, which will be filled with MIG wire welds. With any custom suspension swap, it is a good idea to tack-weld all of the components in place and then mount the A-arms, brake rotors, and even the wheels to ensure they are properly centered in the wheel wells. Doing the job right the first time with quality, care, and attention to detail will ensure not only an efficient installation, but a more enjoyable experience. We opted to use two-inch drop spindles, so the new ride height was checked. It is an easy fix if a modification is required at this point! 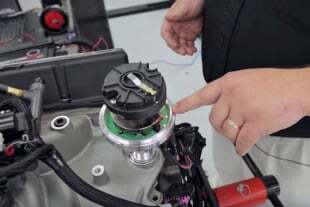 It is a great idea to use the transmission mount to guide you in locating the engine motor mounts and to eliminate having to fabricate a new driveshaft. If the engine and transmission cleared the radiator and firewall before, it will clear them again, even when using new engine stanchions. TCI can supply engine brackets and mounts as an option with the suspension kits. The 351 ci Windsor Ford V8 utilized the traditional Ford mounts for the F-100 chassis and stock style motor mounts. The Ford F-100 front crossmember kit comes standard with manual rack & pinion with the power rack being a $100 upgrade. Now that the front suspension has been test fit, along with mounting the wheels to ensure proper turning radius, the crossmember and spring hats are permanently MIG welded into place. 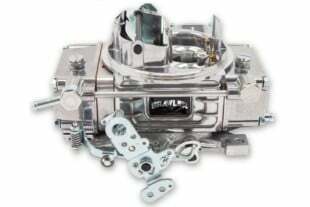 Instructions are included with every crossmember which includes details on how to position the crossmember slightly forward to ensure proper front caster geometry, which self-centers the steering. The Ford truck crossmember has a 57-inch track width which will require wheels with additional backspacing to be used to clear the fenders. A narrower crossmember can be installed if you desire to use wide wheels. As seen below, mounting the rack and pinion steering forward of the crossmember creates a generous amount of header room, access to the stock oil filter location, and a straight shot for the steering column and linkage. TCI recently eliminated the use of Mustang II T-bolts and slots for suspension alignment, opting instead to use thick vertical bars which retain the top A-arms and utilize GM fork style shims for caster and camber alignment. Unlike T-bolts, this system will not easily lose alignment. Basic brakes for this crossmember are 11-inch plain rotors with a 4 1/2 or 4 3/4 wheel bolt pattern. Upgrades include drilled and slotted rotors with four-piston Wilwood calipers, or larger 12, 13 or 14-inch rotors and Wilwood calipers. It all depends upon whether you are using an open spoke wheel where cosmetics are a consideration, or engine performance demands performance brakes. Big whitewall tires from Black Diamond were mounted onto Circle Racing 17-inch billet aluminum wheels to give the Merc an aggressive cruiser look and to clear the large disc brake rotors and calipers. Imagine the eye appeal of a nose up, tail down ride while rolling on this package. TCI also fabricates a universal rear air bag system to be used with three-inch axle tube rear ends. This kit includes soft riding, sleeve style air bags, weld-on rear axle brackets, top chassis brackets, shocks, shock brackets and cup-style air bag brackets. Since the rear air bags hold the entire weight of this heavy Mercury, structurally strong axle brackets are permanently welded onto the 9-inch Ford, three-inch axle tubes. The key is to ensure these brackets are flat and installed with the rear pinion angle at one-degree up! Full rear suspension strength and travel have been fulfilled with the installation of a fat 4-link rear kit along with the rear air bag hardware which will allow the rear of the car to travel a full five-plus inches. Next step is to ensure the rear end housing has plenty of space between the top of the pumpkin and floor pan. Adjustments ensure the wheels are centered and those fat whitewalls clear the frame. 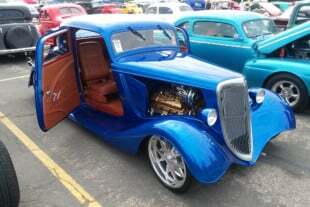 With air bags, these wheels can tuck to where only the whitewalls show once the fender skirts are installed. Utilizing available kits make this an affordable, strong, and safe chassis update featuring four wheel disc brakes and power steering coupled with an adjustable ride height as a bonus! Not only are you giving your classic custom some modern suspension and handling, but with TCI’s front suspension crossmember you’re one step closer to bagging that style that forefathers only dreamt of back in the day! Be sure to give our friends at TCI Engineering a Like on their Facebook page to stay up to date with the company’s latest. And if you’re interested be sure to check out their quality products on their homepage.